Here's news of a notable sale as Jeff Stanley at Gilman Yachts tells me he's found a buyer for the 49.07m motor yacht Zoom Zoom Zoom, a central listing with Mark Elliott at International Yacht Collection. Built by Trinity Yachts in 2005 in aluminium to ABS class, Zoom Zoom Zoom boasts an elegant, sophisticated interior by Evan K Marshall. MCA compliant, accommodation is for 10 guests in five staterooms including a split-level master suite, while twin 3384hp Caterpillar engines give her a cruising speed of 20 knots and top speed of 24 knots. 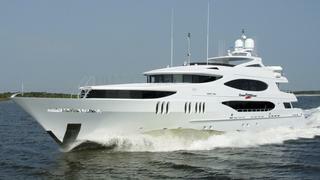 Zoom Zoom Zoom was asking $21.9 million and remains on the charter market with Mark under the same name.